Media production is nowadays not only reserved for traditional media companies such as broadcasters and publishers. Universities and hospitals are also examples of organizations that have to produce, process and archive large quantities of media files. 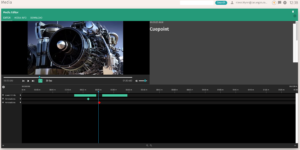 Traditional broadcast systems for mediamanagement, like media asset management systems, are often focussed on the typical rundown based broadcast workflows which Beats supports standard. Because universities, hospitals and large corporates mostly don’t produce (live) televisionshows, they need other features like workflow support during the production of their media assets with specific educational needs. For example metadata models with learning objectives to describe the goals of a video lecture clip. Eumedianet has bundled all its years of experience in the field of media asset management into a new product called “Beats”. 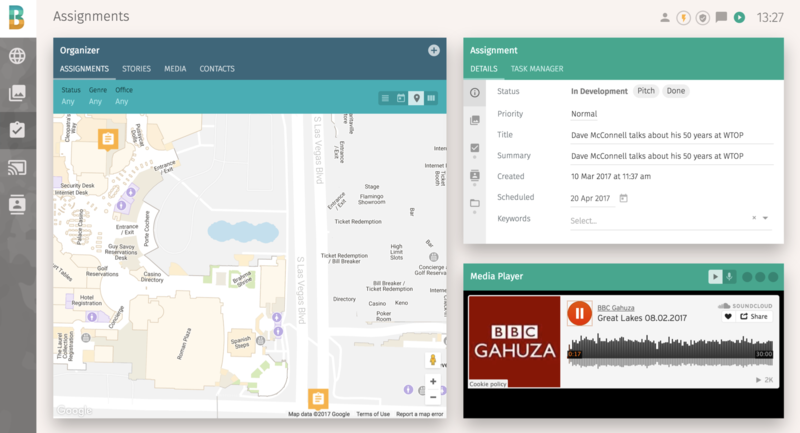 The cloud based media management system as THE solution for supporting media production and the associated workflows. Current clients include the Belgian MEDIAHUIS (owner of NRC and regionale newspapers in The Netherlands and several regional and national tv and radio stations in Belgium), the Erasmus University in Rotterdam, Reading Corner / Comcast (VOD for the US), Teletop in Switzerland and various local broadcasters in the Netherlands. 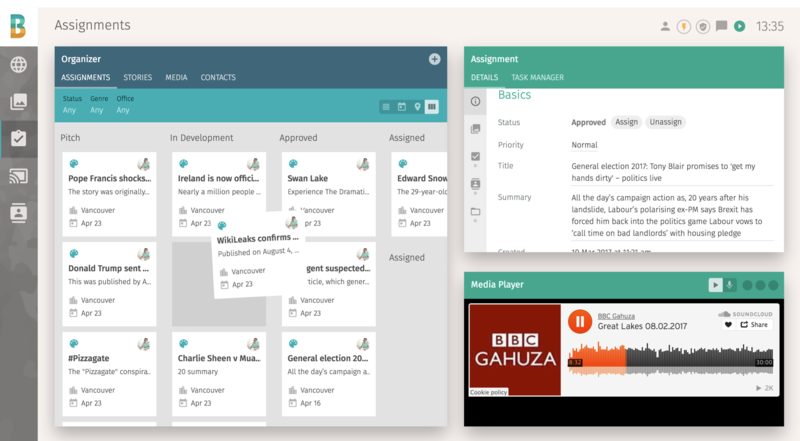 Beats combines project management with episode and session planning, room planning (edit suite and studio) and business allignment with media workflows like newsroom, media storage, transcoding, metadata models, publishing and archiving. Because of the flexible architecture of the cloud software it is possible to adjust the system with additional customizing. The system is build in REACT, a Facebook frontend development that turned into a open source project, and node.js a software application platform. The design is responsive, so you can use the application also on tablets. And….100% cloud based, so no local installation. Just enter a url in your browser and you’re all set. A project can consist out of one video, but also a range of video’s (episodes and sessions). A sessions is a recording or another action that has to be done during the production of the asset. Is you’ve created projects and sessions, you can start booking the production in the available studio’s. For the university, we’ve combined the IEEE-LOM metadata model, with DMS-01 (SMPTE), EXIF and university-specific metadata. Via mappings you can export standard IEEE-LOM metadata. 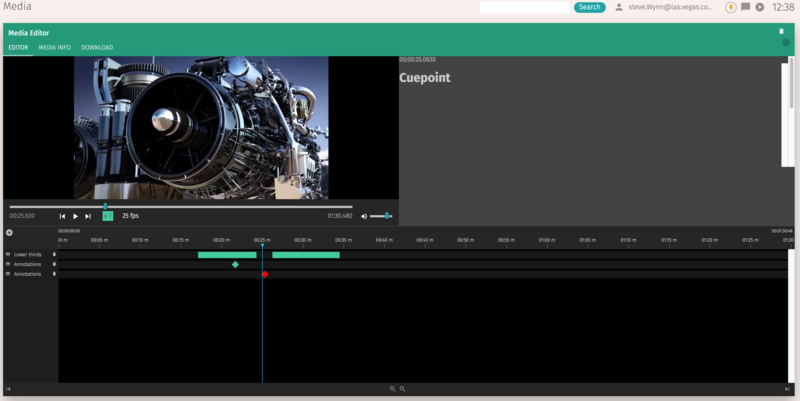 In the Media Editor you can add annotation layers for collaboration. Add comments to the timeline and share these with project members. Also add lower thirds and subtitels and render the video with the graphics. With the build-in transcoding engine it is possible to create exports to a certain location, using a certain transcoding profile. You can create assignments in Beats, for example to record an interview. 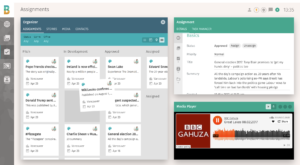 In Beats there are several ways to show that tasks. In a kanban style and/or even on a map. The tasks includes name, location, time and additional information for the preparation of the task. The tasks can have several statusses, to be defined by the customer.